Finnish cheese-metal band Lordi broke out with two major events this week-- the release in the U.S. of their new album, and being announced as one of the headliners of the 2007 OzzFest tour-- so even if you've never heard of Lordi before (like me, five minutes ago), you're forgiven. Just don't tell Satan, or whomever. In the meantime, check out some of the goodies, before the Teezar revival gains momentum and knocks Lordi off the charts entirely. Note that both of these clips have a way better picture quality than the average YouTube video. 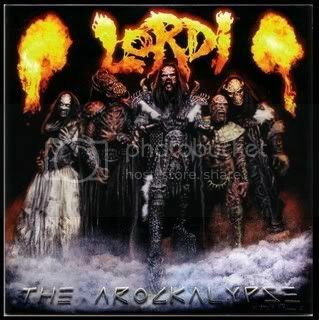 Also, don't be afraid to check out the official Lordi web site. It is for sure a monstrous hard-rock explosion! What Next For The Wolf Pack?